The International Management Centres Association (IMCA) is a professional association established in 1964 and a corporation noble granted the right to arms in the UK by the sovereign in 1985. IMCA conducts workplace action learning and awards professional qualifications. IMCA's work is supported by a distinguished Court of Honorary Members and work with more than 60 corporations around the globe. The phrase 'tea lady' took on a whole new meaning in Oxford! Sarah, a colleague based at Marriotts in Buckingham, kindly volunteered to assist with the preparation of beverages to sustain graudands and guests alike during the robing and photography process. I think readers will agree that tea was indeed being served by a true lady, albeit one who kept her eyes firmly shut! Thank you Sarah, for filling this vital role on the day! Remember those Doctoral candidates from Singapore? The hard work paid off! Here are (from left) Drs Chris Goh, Colin Koh, K C Chan and Casey Loo with Professor Joanna Kozubska, the IMCA Dean for the UK. 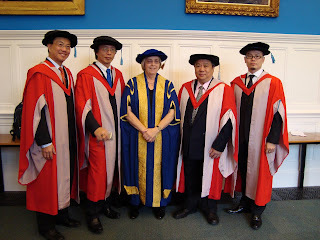 Missing from the picture is Dr Chua Eng Hwa who unfortunately was unable to travel to London. 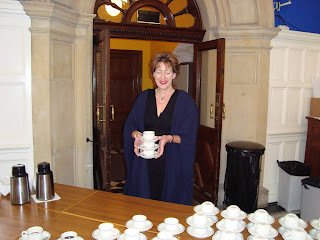 The photo was taken on 5 September at the Oxford University Examination Schools, the venue for IMCA's 2009 Congregation ceremony. Dr K C Chan was as usual wearing more than one hat. 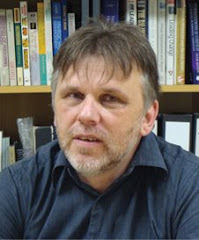 K C was not only the set adviser and supervisor who had successfully steered his cohort of four students towards their doctorates, but K C himself graduated with a higher Doctorate this year, the degree of Doctor of Letters. I spent part of May 'on the road' or rather in the air visiting IMCA partners wherever I found them. 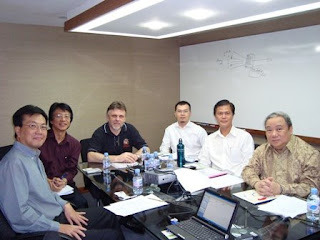 One of our very busy and active Singapore partners Dr K C Chan (on the very right in the photo) who is not only completing his own DLitt, IMCA's very rarely awarded higher doctorate, but also finds time to mentor four Singapore entrepreneurs through their respective DPhil by Explication programmes. There was a lot of energy in the room on the day I visited! Dr K C Chan and his cohort of DPhil associates are now preparing for their external examination and intend to graduate in Oxford in September. It has indeed been a while. Blogging is easy on one hand - but one still needs to allow time for it! From hereon in, this better becomes a regular feature or I will need to issue myself with a written warning! IMCA's Principal, Professor John Wicks, presented both Garry Luxmoore, Dean of FCS, and I with a book entitled "Learning to Fly - Practical Knowledge Management from Leading and Learning Organizations". First reaction - When am I going to get a chance to read this? Second reaction - That sounds just like the book I ought to read! So John, thank you very much for the kind thought and I have every intention to read the book from cover to cover over Easter. We are all busy people. 'One Page Resources' are therefore very appealing - and the self-review chapter reminds me at first glance very much of our own EAML assignments. The book review will be posted here after Easter. Today marks an exciting new development for IMCA - the use of web blogs! In future, Faculty, Associates and Learners will not only be able to keep track of IMCA activities around the world, but can actively contribute through constructive comments towards ensuring that IMCA and its Faculty maintain its currency in all things Action Learning. I look forward in working with you via this medium. The IMCA Faculty of Independent Studies is resonsible for managing the learning process of IMCA's individual learners working for organisations which do not fit corporate university criteria. Need to know more about the International Management Centres Association? Click here to visit our website. GARC is the home of IMCA's Doctoral Programmes. IMCA Socrates is the workplace action learning system for management development and professional certification. The university is dedicated to increasing professional effectiveness in the workplace through action learning processes.